Does it cost to publish or is it free? Publication of article and thereafter archiving of the same is now-a-days a costly affair. Moreover, our journals operate in Open Access and do not ask for subscription. So, your monetary contribution will be required. Anyway, gates of negotiation for concession in publication costs are always open for you. At present journals are indexed in Sherpa/Romeo, Crossref, CiteFactor, Google Scholar etc. Some of our journals are also indexed in Index Copernicus (ICI). The indexing process is advancing every day for new reputed platforms. What about PubMed and ISI? Eligible journals have already applied in Medline/PubMed. The evaluation process is divided in different stages. As soon as evaluation process completes and approval is received, we will inform you. Definitely. At present journals are indexed in Sherpa/Romeo, Crossref, Cite Factor, Google Scholar etc. Some of our journals are also indexed in Index Copernicus (ICI). The indexing process is advancing every day for new reputed platforms. The actual publication cost depends on the type of submitted article. The applicable Article Processing Charges details are available on: www.peertechz.com/article-processing-fee. Can it be an article printed elsewhere? All the journals are in online mode. So, any article not published before in online version will be considered for publication process. Do you accept Thoracic surgery issues? At present, Peertechz is operating around 100 journals which covers Clinical, Life Sciences, Medical, Engineering, Chemistry and Pharma sectors. If you have any article ready for submission, please visit journal details on our website for choosing a suitable journal. Please visit: www.peertechz.com/journals . We will definitely publish your valuable works. Are you an open access journal and do you charge an article processing fee? You are absolutely correct. The journal operates in Open Access and do not ask for subscription. To upkeep the journal maintenance, we ask Article Processing Charges (APC). Moreover, there are no extra charges for submission, publication, page and colour charges, image editing etc. Also, gates of negotiation for concession in APC are always open for you. Is publication in Peertechz journals expensive affair? Publication of article and thereafter archiving of the same is now-a-days a costly affair. Moreover, our journals operate in Open Access and do not ask for subscription. We have segregated all the article processing works in different departments so that submission to publication process can be synchronized and manuscript publication is on scheduled time. Despite all these we ensure that your article gets published in cost-to-cost basis. However, if you have any financial constraints, gates of negotiation for concession in publication costs are always open for you. The journal operates in Open Access and do not ask for subscription. Hence, to upkeep the journal maintenance, we ask Article Processing Charges (APC). We have segregated all the article processing works in different departments so that submission to publication process can be synchronized and manuscript publication is on scheduled time. Moreover, there are no extra charges for submission, publication, DOI, archiving etc. If any author has some funding problem, gates of negotiation for concession in APC are always open for them. Can it be a case report? And what is the deadline? The eligible journals have already applied. The evaluation process is divided in different stages. As soon as evaluation process completes and approval is received, we will inform you. What is the format for articles development? For more clarification on format, you can check already published manuscripts. What is destined by Open Access? Open access is a property of individual works. Users must be able to "copy, use, distribute, transmit and display the work publicly and to make and distribute derivative works, in any digital medium for any responsible purpose, subject to proper attribution of authorship. A digital object identifier (DOI) is alphanumeric unique sequence assigned by CrossRef to identify your published content and to provide a persistent link to its location on the Internet. Please remember that DOI is assigned within 15 days of your article publication. This duration before the assignment of DOI, is an opportunity for the authors to suggest any last moment changes in their published articles. ORCID is the abbreviated form of Open Researcher and Contributor ID. It is a generic alphanumeric code to uniquely identify authors and other contributors. ORCID is a unique way to identify a persistent identity of an author. ORCID is a useful tool that serves as a digital identifier that distinguishes one author/researcher from the other researchers. ORCID provides and supports automated linkages between an author and his/her professional activities ensuring that their work is recognized. If the author has an ORCID; it eases the process of getting DOI number for his/her manuscript. Provide your professional information and other identifiers. Your ORCID will be generated. Are Peertechz journals following the open access rule? Peertechz is exactly Open Access Publication. It is liberal, everlasting, immediate online publication and without any subscription or registration charges. Definitely. Papers published in Peertechz are peer reviewed by well qualified editors and reviewers in relevant field. 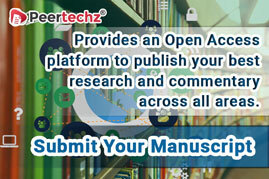 Peertechz adheres double-blind peer review policy for the submitted manuscripts. In double-blind peer review system, the identity of both the author and reviewer is kept hidden. As the reviewers are unaware who wrote the manuscript, they cannot be influenced by their standing within a research community. Moreover, reviewers feel free to comment on the works of experienced and experts of a discipline. What is their copyright policy? What is Peertechz editorial constitution? All journals published by Peertechz will be getting their own Editor(s)-in-Chief and Editorial Board. Total structure of the editorial board members is managed by Editor(s)-in-Chief. Ultimate responsibility for the journals published by Peertechz lies with the Editor-in-Chief. Why we publish article in Peertechz journals? High visibility: Peertechz journal, its open access policy allows maximum visibility of articles published in the journal as they are available to a wide, global audience. Peer Review Process: Rigorous peer review; all articles must be submitted online, and peer review is managed fully electronically. Publication speed: It offers a fast publication schedule. Special Features: The article will subsequently be published in both fully browsable web form, and as a formatted PDF; the article will then be available through Peertechz Journals. Flexibility: It provides an opportunity to publish large datasets, large numbers of color illustrations and moving pictures, to display data in a form that can be read directly by other software packages.